The all-new Kia Picanto has gone head to head with a whole host of popular city cars. 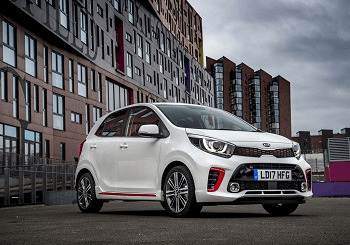 Small, zippy and efficient vehicles are proving more and more popular, so if you’re going to release a car into this category you’ve got to get it right and Kia have gone all out with the new Picanto. This is the third generation of Kia’s stylish city car and comes with five doors and five seats as standard, it is one of the most refined and advanced models from Kia so far. The all-new Picanto is a really good looking addition to the city car range, and demonstrates all the characteristics you could be looking for! Practical, reliable, with heaps of kerb appeal and, with three petrol engines to choose from you are bound to find a Picanto that suits you and your driving style. So, why would you go for the Kia Picanto? Let’s start with the exterior design. Previously you may not have been inclined to associate it with words like ‘hip’ and ‘trendy’ but the 2017 model has set the bar and challenges all previous expectations. There is a lot to like about the new Picanto, with a sporty and agile design demonstrated through bold styling accents and dynamic lines. Compact dimensions are reflected in the handling experience, an easy and responsive drive able to take you down the narrowest of winding streets and easily conquer even the snuggest of parking spaces. City car drivers do not want a big car, and Kia has thoughtfully kept the dimensions the same as the previous model with an overall length of 3,595 mm and an overall width of 1,595 mm. It is the tweaks to the overhang dimensions that have not only enhanced interior space but has also changed the overall look and has given it a more modern and sporty appearance as opposed to the ‘cheeky’ looks it has had previously. This subtly change in character successfully reflects the practical and capable performance too, there is no way you’ll be mistaking the Picanto for a soft play-thing, it means business! Changes in design are apparent in wider grilles and air intakes and the black upper grille with chrome surround is now wider and slimmer which further enhances the Picanto’s sportier appearance. From the side you may notice that the waistline is now lower and flatter and has consequently enlarged the windows and has allowed for much more notable wheel arches. These subtle changes have made the Picanto substantially more sporty, lower stance and emphatic wheel arches signifying performance whilst the enlarged window panes remind us it's also a car designed for driver and passenger comfort! With 7 colour choices to choose from you can really make this compact and modern car your own. On to the interior and, just like the outside, you will not be disappointed. With great personalisation features and their really clever use of soft premium materials throughout the interior you’ll find a very pleasing a quality cabin space. Successfully incorporating comfort into the modern design creates a really calm and open atmosphere, the uncluttered horizontally designed dash is smart and intuitive and is cleverly split up into display and control areas by a satin chrome strip. Kia have even spoilt us with the option of heated front seats AND a heated steering wheel, perfect for those frosty mornings. Speaking of the interior lets talk about space. When you think city car you think compact, right? Well the interior has been laid out with some pretty clever engineering meaning space is actually really impressive. With plenty of head, shoulder and legroom, even in the rear of the car Where the boot is concerned you may be pleasantly surprised to find a really versatile space, 60:40 split folding rear seats means you have the choice between accommodating passengers or luggage. A dual-level luggage board helps you to create a flat loading space and also gives with a concealed luggage area. Even more impressive is the actual space that this boot provides, 1,010 litres of space with the seats down and a really ample 255 litres with the seats up! The whole car is just a really handy and modern space! There are loads of really useful storage areas throughout the cabin, including a glovebox which separate sections, a centre console armrest and a front cup holder all designed to keep you organised and your surroundings uncluttered. Kia have kept in the race where practicality and equipment levels are concerned. This is a really clever move on Kia’s part who have recognised that that final deciding factor is more often than not down to technology and equipment that has been included. With this in mind even the entry level Picanto is really impressive and gives you some pretty key connective features! Aux and USB is included with features often associated with more premium grades like tinted windows and Hill-start Assist Control. Three powerful and refined petrol engines are available in the new Picanto. They have all been designed to provide you with a lively and strong performance, perfect for keeping you agile whilst you maneuver through urban traffic and comfortably reliable and confident on the motorway. A five-speed manual gearbox is standard though there is also a four-speed automatic transmission available too. Throughout the whole range you will find efficient, low emission engines which are more than capable of packing a punch! So, if you are looking for the perfect city car then look no further. Kia have managed to incorporate anything and everything you could want from your vehicle -comfort, technology and primarily space. What makes the new Picanto stand out from the ever growing crowd of it’s peers is the cleverly designed interior. They have not adapted and stretched and compromised the compact and agile maneuverability, but they have given you a more versatile and open space and more capable, modern and sporty character. Overall, the all-new Kia Picanto offers more space and style within the same compact footprint.